The Complete Encyclopaedia of Antiques. London: George Rainbird, Ltd., 1967. Third Reprint Cloth Very Good 4to (7-1/4 x 10), 1472 pp including Index, Museum List and Suggested Further Reading. Hardbound book is a comprehensive classic still in use by antique dealers and collectors. Book is Very Good -- Unmarked, all pages tight and clean. No DJ. (h) Book weighs more than 5 pounds, a consideration in shipping. 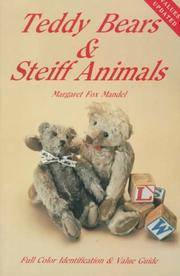 Teddy Bears and Steiff Animals: First Series. Paducah KY: Collector Books, 1984, Updated to 1987. Revised Glossy Pictorial Wraps AS NEW in WRAPS 8vo (5-1/2 x 8-1/2), 288 pp illustrated wth multiple color photographs on every page. Book is FINE in FINE glossy pictorial paper wraps. (h) There is a small veritcal tear on the lower back edge of the spine, virtually invisible as repaired with archival tape. Otherwise book appears AS NEW and UNREAD. Despite price changes in recent years, this is an excellent and essential guide for the collector of Teddy Bears and other Steiff Animals.